Popiah (which means "thin wafer") is a Fujian/Chaozhou-style fresh spring roll common in Taiwan, Singapore, and Malaysia. Popiah is often eaten in the Fujian province of China (usually in Xiamen) and its neighboring Chaoshan on the Qingming Festival. Left: Closeup of a popiah. A popiah "skin" is a soft, thin paper-like crepe or pancake made from wheat flour which is eaten in accompaniment with a sweet sauce (often a bean sauce, a blended soy sauce or hoisin sauce or a shrimp paste sauce), and optionally with hot chilli sauce before it is filled. The filling is mainly finely grated and steamed or stir-fried turnip, jicama (known locally as bangkuang), which has been cooked with a combination of other ingredients such as bean sprouts, French beans, and lettuce leaves, depending on the individual vendor, along with grated carrots, slices of Chinese sausage, thinly sliced fried tofu, chopped peanuts or peanut powder, fried shallots, and shredded omelette. Other common variations of popiah include include pork (lightly seasoned and stir-fried), shrimp or crab meat. Seaweed is often included in the Xiamen versions. Some hawkers in Malaysia and Singapore, especially in non-halal settings, will add fried pork lard. 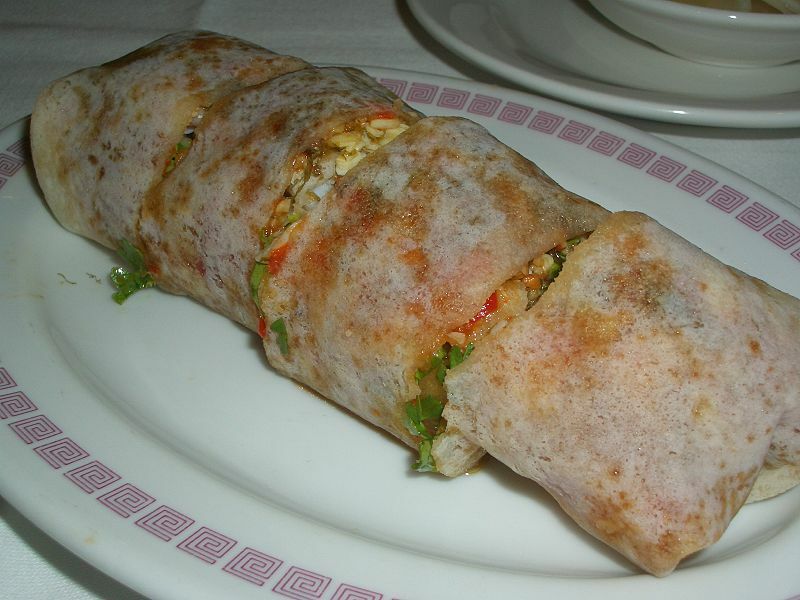 As a fresh spring roll, the popiah skin itself is not fried. Similar foods in other cuisines include the Filipino/Indonesian variant referred to as Lumpiang Sariwa, fried spring rolls and fajitas (Tex-Mex).